LaToya Hall, M.S.W., won the 2019 Champions of Tomorrow Financial Security Award for her work helping economically disadvantaged older adults gain financial literacy and protect themselves from fraud and identity theft. Hall directs the Successful Aging through Financial Empowerment (SAFE) program at Wayne State’s Institute of Gerontology. 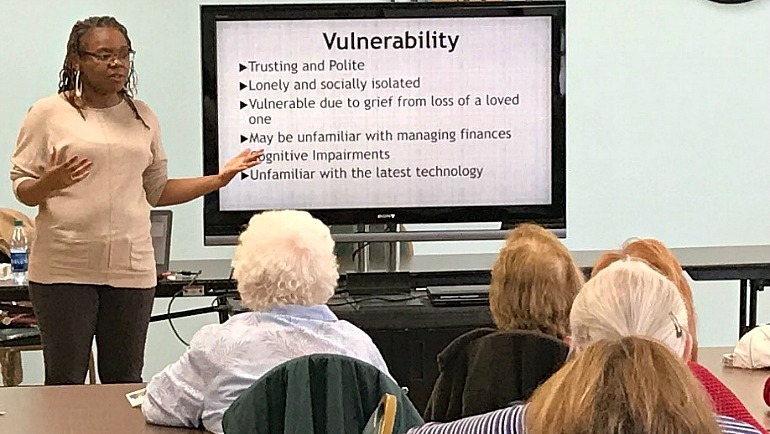 Created about three years ago, SAFE provides free workshops on financial management plus one-on-one counseling services for Detroit’s older adults who have been victims of identity theft and scams. Hall walks clients through how to file police reports and consumer complaints, freeze credit reports, activate fraud alerts, and recover identity. Under Hall’s leadership, SAFE staff have conducted more than 130 workshops and reached more than 5,000 older adults, caregivers and professionals. In nearly half of all counseling cases, SAFE was able to retrieve or save money for the older adults victimized. The Champions of Tomorrow awards are given annually to individuals exhibiting high standards of integrity, civic and social responsibility, and business excellence. The Financial Security Award recognizes Hall’s financial guidance to help communities and families secure their financial future. Champions of Tomorrow Inc. is a nonprofit that provides affordable transportation resources to disabled, economically disadvantaged and older adults in southeast Michigan. Hall will receive the award at a May 1 ceremony at the War Memorial in Grosse Pointe Farms, MI. The Institute of Gerontology researches aging, and educates students, professionals, caregivers and older adults in issues related to aging (www.iog.wayne.edu). The Institute is part of the Division of Research at Wayne State University, one of the nation’s preeminent public research institutions in an urban setting. For more information about research at Wayne State University, visit research.wayne.edu.